Big, burly Scottish-born character actor Ernest Torrence (1878-1933) appeared in many Hollywood films form 1916 on. A towering figure, he frequently played cold-eyed and imposing heavies, but played most of his bad guys with tongue firmly in cheek. 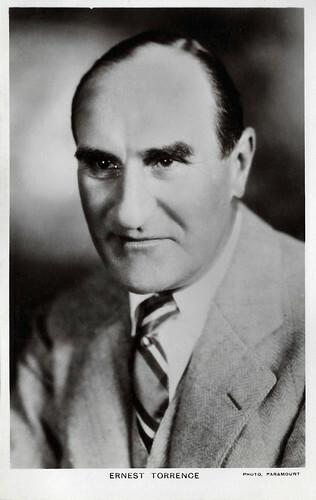 Torrence’s films include including Tol'able David (1921) opposite Richard Barthelmess, Mantrap (1926) with Clara Bow, and Sherlock Holmes (1932) in one of his last roles as Holmes’s nemesis Professor Moriarty. British postcard in the Picturegoer series, London, no. 167. Ernest Thayson Torrance-Thompson was born in 1978 to Colonel Henry Torrence Thayson and Jessie (née Bryce) in Edinburgh, Scotland. His younger brother would be the actor David Torrence. As a child, Ernest was an exceptional pianist and operatic baritone and he graduated from the Stuttgart Conservatory and Edinburgh Academy before earning a scholarship at London's Royal Academy of Music. He toured with the D'Oyly Carte Opera Company in such productions as The Emerald Isle (1901) and The Talk of the Town (1905) before disarming vocal problems set in and he was forced to abandon this career path. Sometime prior to 1900, he changed the spelling of Torrance to Torrence and dropped the name Thompson. Both Ernest and his brother David Torrence went to America, in March 1911, directly from Scotland prior to the First World War. Focusing instead on a purely acting career, Ernest and his brother developed into experienced players on the Broadway New York stage. Ernest received significant acclaim with Modest Suzanne in 1912, and a prominent role in The Night Boat in 1920 brought him to the attention of the early Hollywood filmmakers. Torrence played the moronic, twitch-eyed thief Luke Hatburn in Tol'able David (Henry King, 1921) opposite Richard Barthelmess and made his mark as a cinema villain. He settled into films for the rest of his career and life. He played Colleen Moore’s abusive husband in Broken Chains (Alan Holubar, 1922). Torrence gave a sympathetic portrayal of a grizzled old codger in the acclaimed classic Western The Covered Wagon (James Cruze, 1923) and gained attention from his role as Clopin, king of the beggars opposite Lon Chaney in The Hunchback of Notre Dame (Wallace Worsley, 1923). British postcard in the Picturegoer series, London, no. 167a. Photo: Paramount. He played an Army General who escapes into the circus world and becomes a clown in The Side Show of Life (Herbert Brenon, 1924). In an offbeat bit of casting he paired up with Clara Bow in Mantrap (Victor Fleming, 1926), unusually as a gentle, bear-like backwoodsman in search of a wife. He appeared in other silent film classics such as the epic The King of Kings (Cecil B. DeMille 1927) as Peter, and Steamboat Bill Jr. (Charles Reisner, 1928) as Buster Keaton's steamboat captain father. 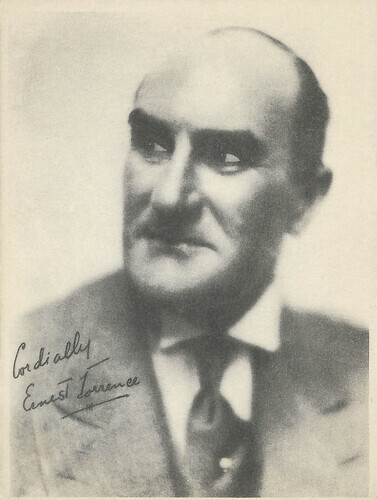 During the course of his twelve-year film career, Ernest Torrence made 49 films, both silent and sound films. Torrence made the transition into sound films very well, starring in the Western Fighting Caravans (Otto Brower, David Burton, 1931) with Gary Cooper and Lily Damita. 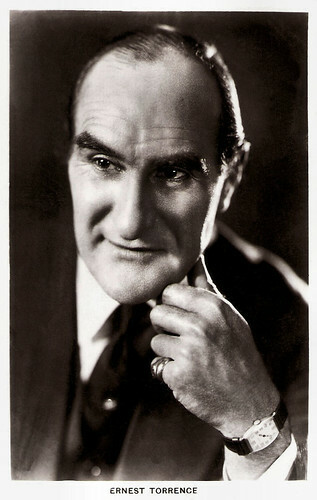 He was able to play a notable nemesis, Dr. Moriarty, to Clive Brook's Sherlock in Sherlock Holmes (William K. Howard, 1932) in one of his last roles. Filming for I Cover the Waterfront (James Cruze, 1933), in which he starred as a New York smuggler opposite Ben Lyon and Claudette Colbert, had just been completed when he died suddenly on 15 May 1933. He was only 54. While en route to Europe by ship, Torrence suffered an acute attack of gall stones and was rushed back to a New York hospital. He died of complications following surgery. Ernest Torrence was married to Elsie Reamer Bedbrook and he had one child, Ian Torrence. Scene with Torrence and Clara Bow in Mantrap (Victor Fleming, 1926). Source: Jeff Alanson (YouTube). Scene from Steamboat Bill Jr. (Charles Reisner, 1928). Source: Movies and Videos (YouTube). Sources: Gary Brumburgh (IMDb), Bobb Edwards (Find A Grave), Hal Erickson (AllMovie), Silent Hollywood.com, Wikipedia and IMDb.